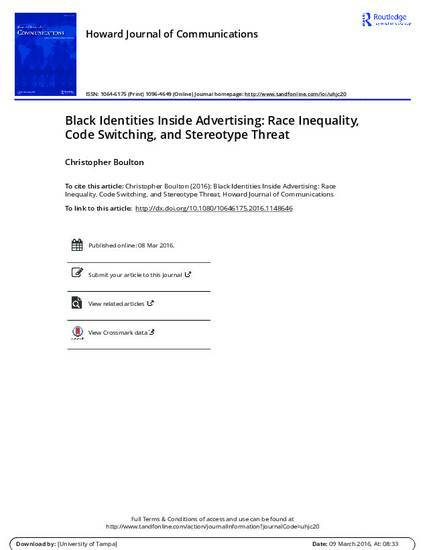 This article explores Black identities within the U.S. advertising industry—an atmosphere charged by a history of discrimination against, and continuing underrepresentation of, African American practitioners. Drawing on theories of code switching and stereotype threat, I interpret data from a set of focus groups with Black interns working at agencies in New York City and argue that their supposed race-based affiliations conceal deeper anxieties of cultural belonging marked by fissures of class and language that trigger self-monitoring and thus undermine retention and advancement in the advertising field. Furthermore, I contend that the added psychological burden of stereotype threat makes Black interns wary of seeking out help from other more established Black employees—for fear of being seen as preferring their own race—thus placing them at a career development disadvantage vis-à-vis Whites, who have no qualms about affiliating with and mentoring other Whites. I then offer some strategies for closing the White–Black labor gap in advertising ranging from agency reform from within to clients exerting structural pressure from without and conclude with a call for communication scholars to move beyond the text and critique race representation at the point of production. The Howard Journal of Communications is a quarterly journal that publishes original and current research papers focusing on ethnicity and culture as they interact with communication. The purpose of the journal is to serve as a forum for researchers as well as policy and decision makers who seek to use research as the frame for social awareness and change. The journal has a strong history of providing space and voice for persons and ideas that would otherwise be silenced. The journal invites work that makes important contributions in its focus areas. These may include a variety of topics such as gender, ethnic representations in the media, interracial issues, cultural resistance, and much more. The journal welcomes a variety of methodologies, both quantitative and qualitative. All papers go through a process of rigorous blind reviews by top scholars in the field.